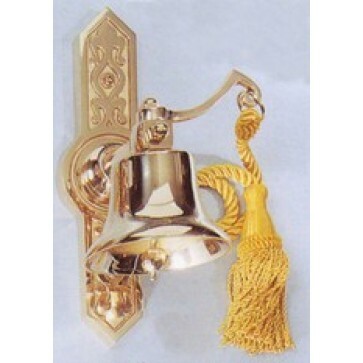 Finely crafted Wall Sanctuary Bell, 4" wide and 12" high with Gold Pull Cord and Tassel at the end, oven baked for added durability. This beautiful sanctuary bell can be made of Bronze or Brass metal with a Satin or High Polish finish, please specify when ordering. Ideal gift for the church use. This bell will make beautiful sound due to their high quality construction.